This splendid home doesn't seem big or magnificent from the street. In fact, it seems rather introvert and hidden away from prying eyes. But that doesn't mean that this house is any less amazing inside! Behind the cold iron fence of the exterior, this home hides a lavish and luxury secret of modern style, clean lines and a spectacular view. 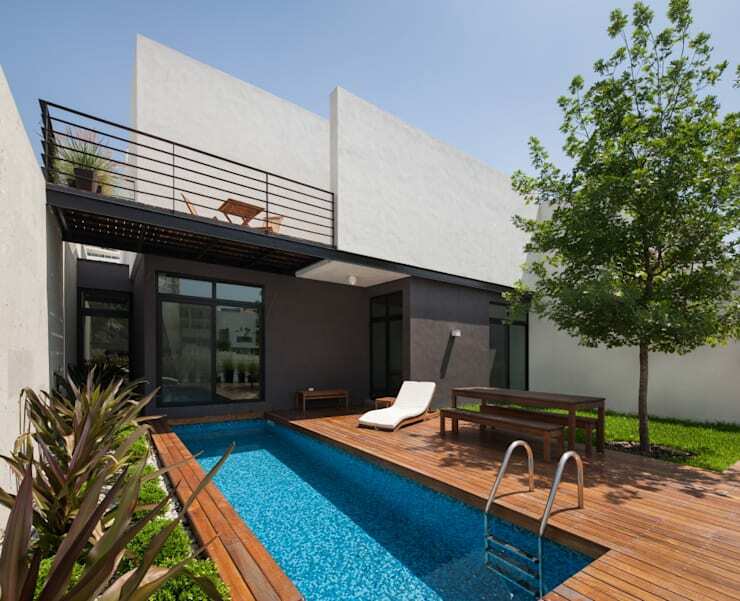 Although the home is diminutive in size, according to the square metres of the plot, its packed full of awesome design, well thought out spacing and even has a fantastic swimming pool and terrace. The entire home is decorated with a sleek and modern sense of style in mind, making it that much more amazing! This design inspiration was elegantly coordinated by the magic team at LGZ Taller De Arquitectura in San Pedro Garza García, Mexico. Today we begin the home review by enjoying the sight of the terrace view, it is the perfect place to just relax recline and soak up the sun, and with the presence of an upper deck too, there's an opportunity to enjoy the view from an even higher perspective. The brilliantly designed deck area allows the area to be used to its maximum potential with enough seating space, simple garden and even the addition of a nice tree that adds greenery to the otherwise rather neutrally toned terrace area. The swimming pool is partially cover by the upper deck provide some shade during those really hot summer days, while the azure blue pool looks so inviting and welcoming. Anyone would just want to jump in and enjoy the cool water splashing all over! This is only the beginning of how this somewhat petite house, shows off its style and attractive qualities. 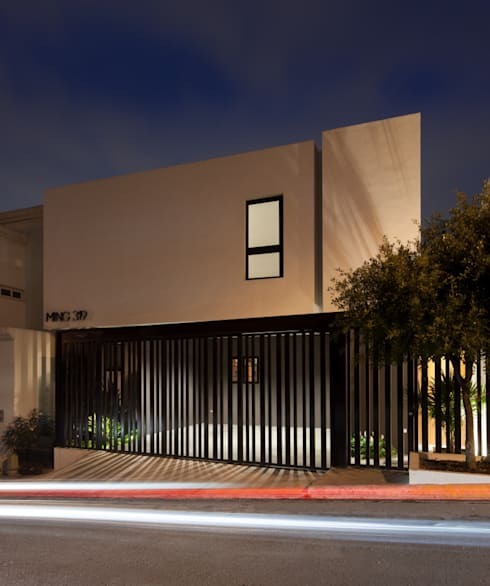 The street view of this home almost hides away the actual fascination which this home is all about on the inside, and looking like a shy exterior version of the extroverted interior. Hidden behind the back iron fence is the entrance and garage, while the addition of some greenery and vegetation provide some life to an otherwise seemingly quiet outside view of this home. While the exterior tone of the walls maintains the clean lines and geometric design which is evident indoors too, the inclusion of only one window on the upper level seems almost strange. But for privacy and intimacy sake keeping the exterior of the home just that… exterior, means there is no distractions from the outside world that the inhabitants need to worry about or even take note of. And with the abundance of natural light coming into the house through the terrace, it won't be dark indoors after all. This entrance to the home is hidden away from the street and can only be viewed on closer inspection of the home, it seems like these owners really enjoy their privacy! But that doesn't make the entry way any less modern minimalist chic as seen with the outside view of this exhibiting the same appearance. The addition of the wooden door gives us a glimpse of what to inspect in the interior. Including some greenery to the front garden area of the home adds a sort of lived in and living effect, while the elegantly placed wooden walk way and white pebbles creates a more enchanting entrance to the home. 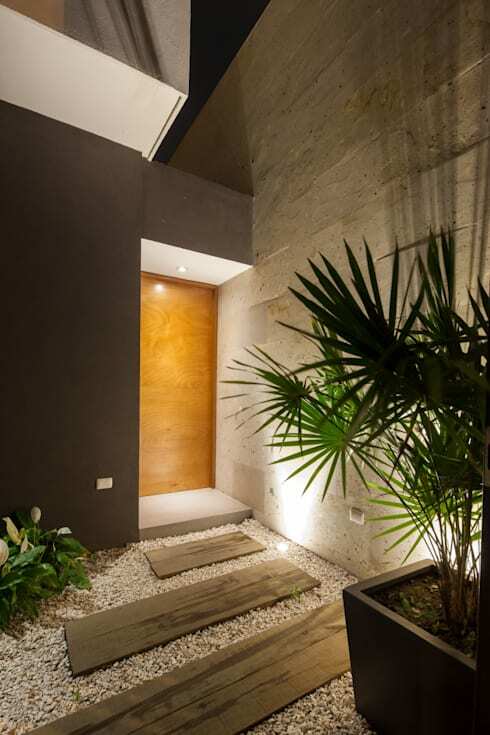 The dark wooden blocks of the walk way are also in contrast with the white pebbles, but each aspect of this front entrance of the home work well with each other. Creating a less stark and under-designed home with scarce decorations. The interior open plan living of this home can be fully taken in and admired through this example, it clearly shows a different tone used to that of the outdoors. Much more welcoming, inviting, appealing and warm with an awesome designer kitchen, comfortable living room space and a generous dining room area wrapped into one room. The natural and neutral tones used through the interior of this home provides a cosiness and with enough large windows and glass doors positioned throughout the living space area, natural sunlight and fresh air will not be missed out or neglected anywhere. 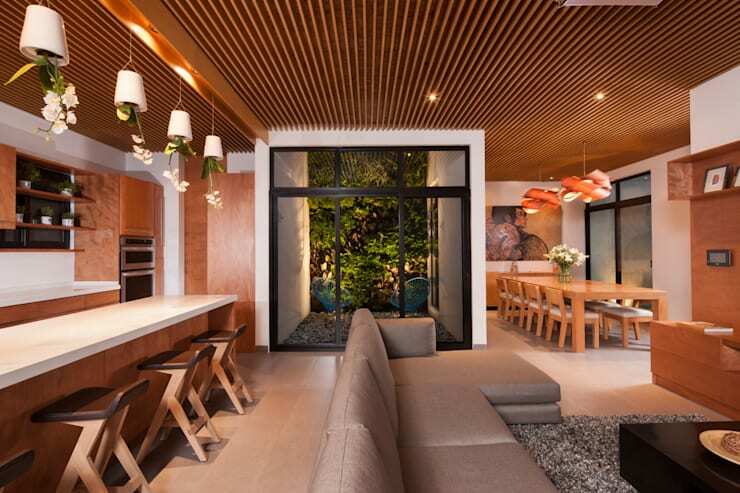 Finally, situated in the centre of the living space is a small courtyard with a stunning vertical garden, allowing some green to be accepted into the inside of this home too. While the area of the room is not big, the undeniable uncluttered approach of this minimalist open plan living space was done in complete harmony. For more living room inspiration from homify, check out: Tips To Create A Really Cosy Living Room. A red bathroom in a house with such a serene and tranquil atmosphere might probably raise an eyebrow or two, but a home is after all the reflection of the characters that live inside, so why not have a red bathroom and dare to be different? This modern and minimalist white ceramic space in contrast with the different shades of mosaic red tiles, might not be for everyone, but it certainly adds a vibrant edge to this home in its entirety through the splash of these contrasting colours. 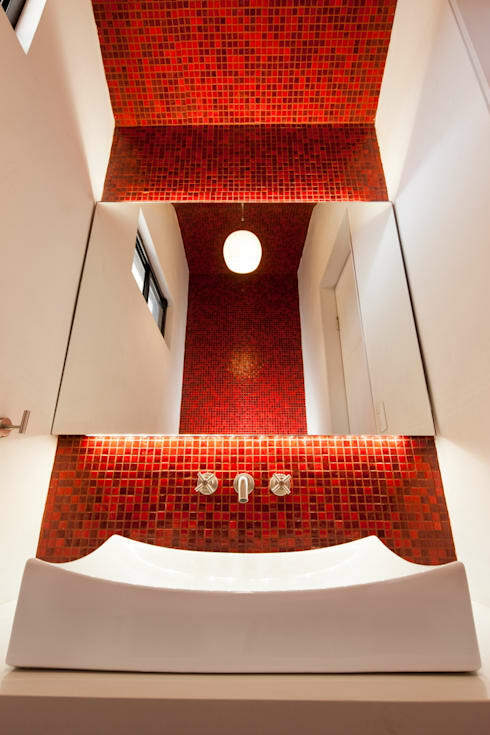 What makes this bathroom even more different is the floor to ceiling approach of the red, which is further accentuated by the perfectly placed mirror and ceiling light, almost doubling the brightness of this confined space. The minimalist faucets included in this bathroom and the entire design of the space does have a kind of peace to it, don't you think? 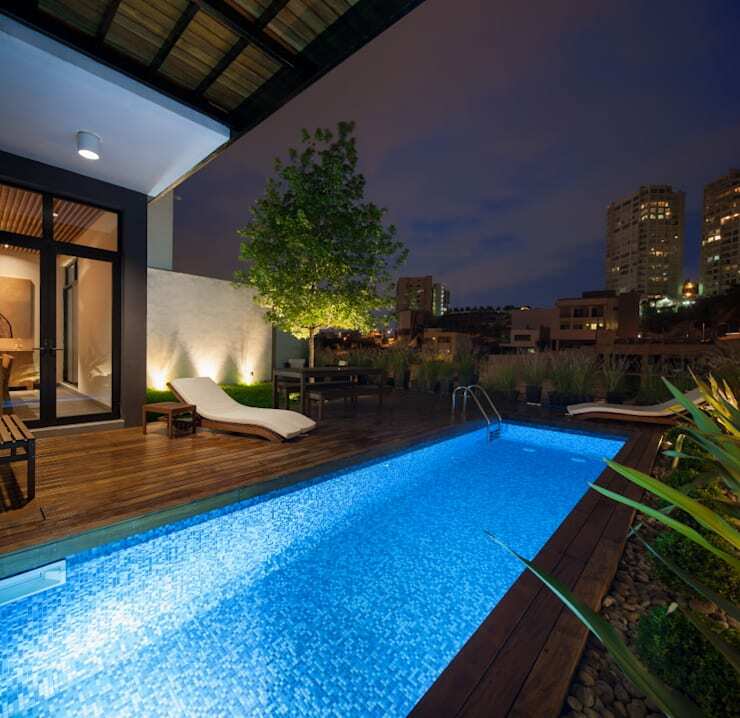 Heading back up to the terrace for a second and final view of this magnificent swimming pool and serene relaxing area which each home requires, how about just enjoying the view of the city while you take in the fresh evening air? Enjoy a relaxing twilight date at the swimming pool and then go for a late evening swim or just admire the cool, gentle breeze and the true blue pool in the company of good friends and family after a night out on the town or an awesome dinner party. While the exterior of this home hid so much away about the interior, the inside has made up for it by being every bit as spectacular as we could imagine. The shaded area provided by the upper deck even protects the dining room from the harsh midday sun. So high tea won't be consumed by heat of the day. What was your favourite aspect of this stylish home? Let us know!